In MDS, you can set weight values on members in a collection, so that certain members count more than others when you do analysis in a subscribing system. For example, in this sample collection that is used to determine royalties for our MDS book, Tyler (my co-author) and I are equals. The collection contains both of us, and we both get half of the massive royalties we’re expecting. Imagine there is a second edition of the book, and we decide that Carlos, our technical reviewer, will take over my part of the book. I’ll still get some royalties, but not the full amount. You can use this collection to accurately calculate what’s owed to Carlos, Tyler, and me. In general, for each member in the collection, you specify an integer. And you want every level in your collection to equal 1.00. To set weight values in MDS, you open the collection (CN) table for the entity and update the weight value for each member in the collection. You can do this manually or by using a stored procedure. When you create a subscription view with the Collections format, a Weight column includes the values you set. This view is used by subscribing systems to consume the data. And you must be able to update the collection table that contains the weight values (a table that ends in CM). If you’re going to use the stored procedure, you must also be able to read mdm.tblUser. 1. Open mdm.tblModel. Note the model’s ID in the ID column. 2. Open mdm.tblEntity. Find the entity that’s enabled for (use the model ID in the Model_ID column for assistance). The names of the collection tables are displayed in this row. The model and entity IDs are combined to determine the name of the collection tables. 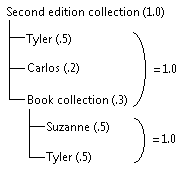 For example, if the model ID is 4 and the entity ID is 12, the collection tables are tbl_4_12_CN and tbl_4_12_CM. 3. Open the CN table, which lists all collections for the entity. Based on the value in the Name column, note the ID in the ID column. 4. Open the CM table, which lists all members in the collection. In this table, in the Parent_CN_ID column, the ID of the collection (from step 3) is listed. In this example, we can see that there are only two members in the collection with an ID of 1 in the Parent_CN_ID column. Paste the following text into a new SQL query window. Execute to create the stored procedure. @User_ID – The ID column from mdm.tblUser. @Version_ID – The Version_ID column from the CN table. @Entity_ID – The ID column from mdm.tblEntity. @Collection_ID – The ID column from the CN table. @Child_ID - The Child_EN_ID column from the CM table. @ChildType_ID – The ChildType_ID from the CM table. @WEIGHT – An integer of your choice. When you create a subscription view with the Collections format, a Weight column includes the values you set.